Groundwater depletion is one of the next big business issues. Of the 500+ transboundary aquifers on which the world depends for drinking water, only 6 have agreements in place to manage their water use. 90% of groundwater is unregulated, unmonitored, and much of it is being depleted at an alarming rate. A lack of trust among nations sharing underground water reserves, and weak governance systems in place, create an unprecedented risk to regional security in many of the world’s already volatile régions. This is sharply increasing the risks to the license to operate and business continuity of large multinationals in food and agriculture, extractive and power sectors. 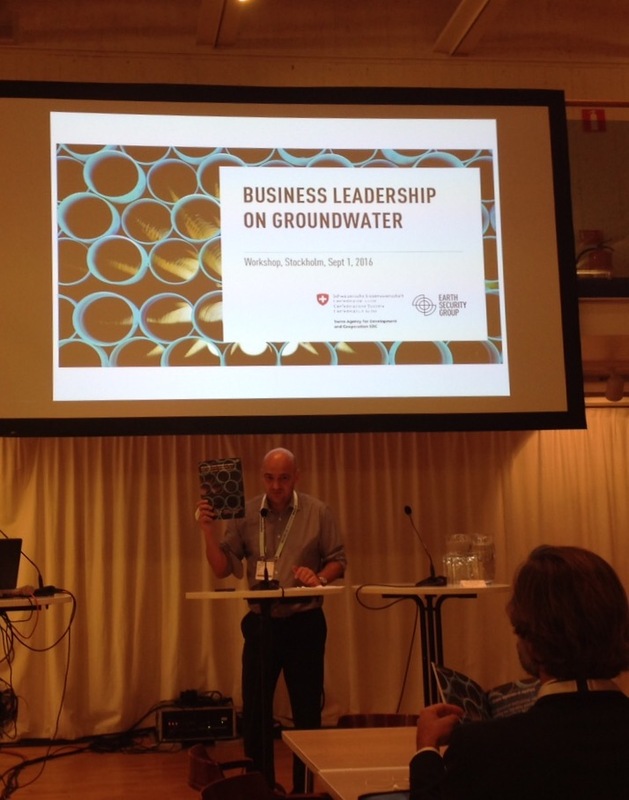 ESG’s CEO Briefing: Global Depletion of Aquifers released at Stockholm’s World Water Week on Sept 1, 2016, with the Swiss Agency for Development and Cooperation, evaluates the actions being taken by large multinationals, and the ways in which companies are communicating groundwater risks. 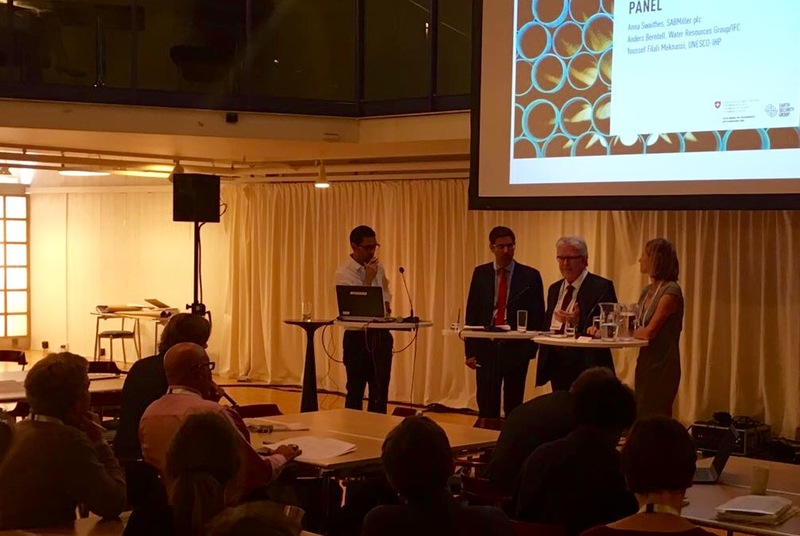 ESG’s workshop opened the space for a conversation among companies, governments and experts on the role of business in advancing transboundary aquifer governance. Photo: Johan Gély, Head of Global Water Programme at the Swiss Agency for Development and Cooperation discussing ESG’s CEO Briefing: Global Depletion of Aquifers. Better communicate the work they are already undertaking to mitigate groundwater risks and prepare to engage externally on a topic that will grow in urgency. Define a position on how to strengthen transboundary aquifer governance in regions that are sensitive to their operations, with opportunities to work across borders through their subsidiaries, where they are present in multiple countries sharing an aquifer. Use corporate assets, such as groundwater data, to initiate collaborations with local and regional stakeholders, such as NGOs, universities and government bodies with a view to strengthen groundwater decision-making. A discussion with 70+ people from business, government and policy-making, engaged in an open and frank conversation on challenges and opportunities with a panel composed of SABMiller plc, a global brewer with a global footprint in more than 80 countries; the 2030 Water Resources Group at the International Finance Corporation, the leading multi-stakeholder platform bridging cooperation of business and policy-makers on water stewardship around the world; and the International Hydrological Programme of UNESCO, the UN body tasked by Member States with the monitoring of groundwater governance in the context of the UN Sustainable Development Goals. As a result of the session, ESG is helping companies and policymakers to discuss a series of opportunities for public-private partnerships. ESG’s powerpoint for the workshop can be accessed here. Photo: (from right) Anna Swaithes, Head of Sustainable Development, SABMiller plc; Anders Berntell, Executive Director, Water Resource Group/IFC; Youssef Filali Meknassi, International Hydrological Prorgamme (UNESCO); Alejandro Litovsky, Founder & CEO, Earth Security Group.